Junior doctors in UK have staged their second walkout of the year, a 24-hour long strike after government legislators were unable to come to a resolution with the British Medical Association (BMA) regarding increased pay for weekends and evening work hours. Negotiations between the BMA and the Department of Health have been ongoing since 2014. Most of the debate centers around higher compensation for junior doctors who work during non-normal working hours. The junior doctors' strike will take place on Wednesday February 10th to protest the British government's perceived lack of protection for workers' rights, after peaceful negotiations between the government and doctors' unions broke down yet again. Currently, junior doctors are paid more during night shifts between the hours of 7pm to 7am during the typical Monday-Friday work week. The BMA advocates for increased pay to junior doctors on Saturdays, which they claim is not a normal working day. They take a similar position regarding evening work hours, which they claim "has a greater impact on personal and family life.” Studies have also shown that employees who work night shifts face a 41% higher risk of cardiovascular health problems. On the day of the strike, thousands of junior doctors will withdraw from working - with the exception of emergency services such as maternity care, intensive care, and A&E. More than 2,800 planned non-emergency operations have been cancelled. An overwhelming 98% of the 45,000 junior doctors working in Britain voted in favor of a 24-hour strike on Wednesday, February 10th to protest the government's refusal to recognize Saturday as a non-normal work day. Doctors in the UK have not taken industrial action towards a strike since the mid 1970's, though nurses and ambulance workers did stage a walkout in 1985. The public majority is in favor of the strike, with polls from Ipsos MORI for BBC Newsnight showing 66% public support for the walkout as long as emergency care is still provided. 64% of the public polled say that the government is to blame for the 24-hour strike, with only 13% placing the blame upon the junior doctors or the BMA. 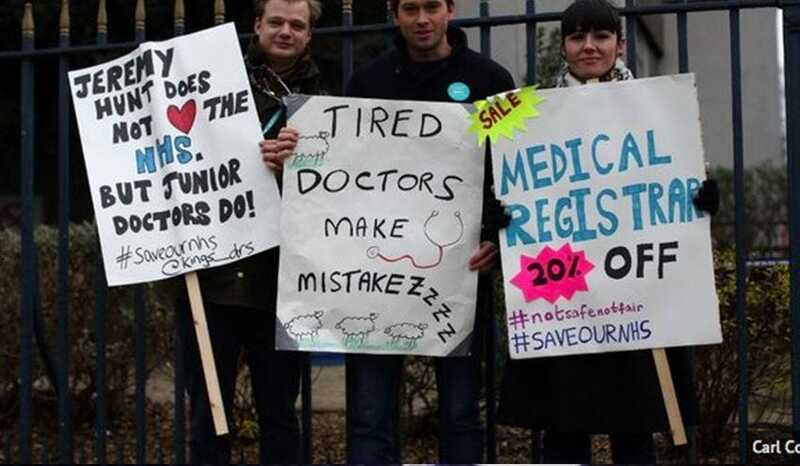 Junior doctors in the UK and their supporters have been using the hashtag #JuniorDoctorsStrike to express their solidarity throughout social media platforms. The doctors' discontent stems from what they consider to be a basic lack of respect for healthy work-life balance by the UK government and the health secretary, Jeremy Hunt. Many feel that the junior doctors' strike could have been avoided if the Department of Health had been willing to accept the BMA's compromise for a "cost-neutral" plan that would have increased doctors' pay for anti-social hours in exchange for cutting premium pay. Health secretary Jeremy Hunt has avoided public comment regarding his role in the decision to veto the BMA proposal, though accusations have surfaced that he was the only government official to reject it. The general public has largely fallen into support of the junior doctor's movement. Public respect in Britain for doctors is very high and many feel that the government's "mishandling" of these negotiations is a symptom of larger issues regarding workers' rights. Former National Health Services chief executive Nigel Crisp has commented, saying "This isn't...just about the technicalities of the dispute. I think this is about junior doctors feeling undervalued, unloved and not cared for."